"Despite having endured plenty of sisterly squabbles, Cassie Kramer knows it’s up to her to find younger sister Allie when Allie suddenly goes missing from the film set of Dead Heat. Cassie and Allie, daughters of ’70s bombshell starlet Jenna Hughes, are both promising Hollywood actresses, but because Allie’s career skyrocketed past Cassie’s, causing a falling-out between the sisters, Cassie now—with the police suspecting murder—finds herself a person of interest. As other cast and crew members of Dead Heat are found dead, Cassie struggles to stay calm. With a history of institutionalization for psychosis, and an estranged, nearly ex-husband who is trying to win her back, Cassie has a lot at stake, which veteran genre author Jackson employs to generate near-constant suspense, weaving together disparate plot turns, directing a large cast of characters, and playing up movie-star egos and show-biz gossip to give the novel a vintage Hollywood feel. 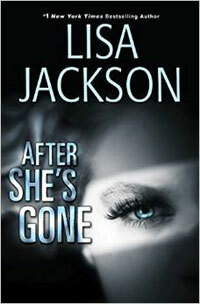 With moderate gore, a hint of romance, and many dynamic female characters, After She’s Gone is a sure bet for Jackson’s popular blend of women’s fiction and suspense. A mysterious new character in the epilogue suggests more to come." Jackson’s latest is a well-crafted story full of suspense that will keep readers on the edge of their seats. With her skillful, vividly descriptive storytelling, Jackson brings us an intriguing plot with a strong yet flawed heroine at its center. With steady pacing, plenty of action and a few plot twists, Jackson’s thrill of a read will hook readers in.